Accent your bathroom with the flowing curves and classic charm of the Moen Eva Two-Handle High-Arc Roman Tub Faucet without Valve. This faucet features a high-arc swan-like spout and two convenient petal-like lever handles that give you control of water temperature and flow. 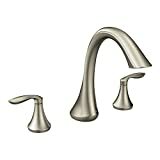 The faucet is compatible with the Moen M-PACT valve system that makes it easy to update your trim kit without touching the plumbing, and features a LifeShine brushed nickel finish that resists flaking and corroding for the lifetime of the faucet. With a transitional design and backed by Moen’s Limited Lifetime Warranty, the Moen Eva Two-Handle High-Arc Roman Tub Faucet adds a classic touch to any three-hole bath. *Moen Two-Handle Roman Tub Valve sold separately. Offering an elegant, transitional design that gives today’s home timeless appeal, the Moen Eva collection’s tapered, sophisticated lines will never go out of style. This high-arc Roman tub faucet in brushed nickel features a two–handle lever design for ease of use and a conventional deck mount design. It is ADA compliant. 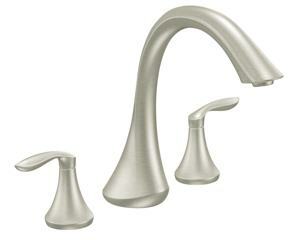 The Eva high-arc Roman tub faucet in brushed nickel (view larger). Note that this faucet does not include a valve. Moen LifeShine finishes are guaranteed not to tarnish, corrode or flake off for life. Developed exclusively by Moen, in collaboration with NASA Glenn Research Center, the LifeShine finish offers enhanced resistance to abrasion, corrosion, and chemical attack. The LifeShine finish is in the surface–not on it–resulting in color stability for the life of the faucet. The Physical Vapor Deposition (PVD) technique helps to eliminate hazardous by-products during the manufacturing process. With Moen, changing your bath and shower faucet style is as easy as changing a light bulb. Install any of Moen’s M–Pact-compatible faucets once, and you can upgrade the style at any point in the decorating or construction process–or switch style years down the road–without replacing any faucet plumbing. All changes can be made above the deck or in front of the wall. This Moen Eva is backed by a limited lifetime warranty against leaks, drips and finish defects to the original consumer purchaser. For commercial installations, it’s backed by a 5-year limited warranty.